DDT: This DDT is for daily episode discussion wherein everyone who is watching the show can post the happenings, incidents etc from the day's show and then discussions ensue on these happenings. Updates: We have our coolbie gypsy2525 to give us regular update. It is a request to all members not to post before gypsy2525 reserve her post for update and also not before the episode begins. All such posts will be deleted. Every day episode starts @ 9 pm I.S.T. A humble request to all members not to chit chat in this DDT thread as many members like to read about members views on the episode and sometime they find it hard reading about it if there is lot of general chit chat across the pages. Hope you all understand. About the show: The recordings of a couple of days are edited and encapsulated into an entertainment package. Hence what we get to see may be discontinuous and incomplete truth. Every day the DDT will be posted before the episode begins by BB6 DT. Have patience, if and when it is late by few mins. IF COC and BB6 Section Rules are applicable for all DDT posts. Remember : "The only way to win an argument is to avoid it." Suggestions are welcome.THANK YOU Enjoy & Have Fun!!! 8.45 am- Sapna asks Kashif if he wants to leave on friday .He says it doesnt matter ,His life is set .He says he wanted to ask Bigg Boss to send him clothes but he will wait for friday . And he repeats life is set . Sapna gets irritated and tells him she doesnt like him being repetitive.He says so what let me speak ,am I not entitled even to speak ,if u don't like it dont hear what I speak. Rajeev tells Sana that since he has left the kitchen team he has so much time for himself an is exercising . Ashka is nervous and she addresses the camera that she cant handle the show and wants to quit. She cries because of yesterday's coffee episode and Urvashi tells her not care for anything. Delu comes to the bedroom and tells ashka that this is a very big opportunity and she should not let it go from her hands. She gives her example and says that she needs the show and handling rajeev is the biggest task for her . She says she can see rajeev landing into trouble but she will not come in between . 1pm- Urvashi pampers Ashka .Delu sings a song sun sun didi tere liye ek rishta aaya hai . BB punishes rajeev by telling him to handle the kitchen completely from cooking to washing the vessels .. He has to select two male assistants to help him and treat the women of the house well. He and his helpers can eat only after the kitchen chores are done . He selects niketan and aseem . Rajeev tells her that he is supposed to serve the ladies first and then only anyone can eat .She leaves her plate in disgust . Karishma says sampat is sweet in doses. Vrajesh says she is also sharp and has a brain of 2 people combined. Urvashi .asshka and delu are sitting in the garden and urvashi says someone should go in the kitchen and tell rajeev to make rotis. Rajeev asks all the ladies what type of chai they all want . Urvashi tells him to go immediately in the kitchen and he says he is resting for awhile . She says when they were in the kitchen team they never rested . He takes Aseem with him and Urvashi objects to it . 5pm- Urvashi taunts Rajeev and says ye time take hum khaana banane ki taiyaari karte thay . She tells him she wants 2 rotis. Rajeev says he is going to make khichdi and urvashi says she wants roti . Ashka comes to tell rajeev that urvashi wants roti and rajeev agrees . Karishma apes her dad ,the way he dances with his mouth open and Sidhu whistles at her performance . 6pm- Rajeev addresses the camera and says that during Sidhu's punishment everyone had khichdi .But during his time urvashi is creating a ruckus and he says that henceforth he will have only rotis in the night. Urvashi sends Karishma to find out what is cooking and Rajeev says it will take an hour . Urvashi tells Karishma to go and tell Rajeev to make eggs for themsince they are very hungry . She comments that rajeev will make the eggs anyhow because his sitaarey are in gardish. fighting him and says he is ek number ka maahir in dictatorship.She calls him ehsaanfaramosh in the room . She says from three days he is taunting her . Rajeev is irritated and Aseem and niketan ask him to keep his cool. Urvashi is raving and ranting still in the room . Rajeev goes in the room and tells urvashi to lead her own life and play her game . She tells him she does'nt want any haq .She says yesterday he had said that he wanted to come in the room but was unable to because delu was in the room.He tells her not to get personal with him and screams at her . Sapna tells Vrajesh that till today no one has ever asked anyone to make snacks in between and yet he still made it for them . Sapna comes and asks urvashi if she wants to have food . and she says woh khaane pe thukungi bhi nahi. Vrajesh tells Rajeev that everyone dies to call them for inaugrations and people will disrespect them once they go out . 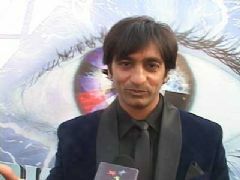 Vrajesh sings aao hum apne cheekhein failayein yahan wahan tahan ,,kainaath mein ,,He is disgusted. Vrajesh cries hugging Siddhu .Siddhu tells him tu kyun bojha uthaata hai ye sab ka jab tu zimeedar nahi hai. Vrajesh cries because he says he knows these people and siddhu says its not his matter to worry about. Siddhu tells Urvashi that the public is watching them fight for rotis .She says she is a very self sufficient girl. Siddhu says yes she has been cooking for everyone. He tells her if she does'nt eat no one will. She says rajeev is not a good guy and he fought with her for eggs . Urvashi tells siddhu she will never have anything cooked by Rajeev. She says she is wondering why vrajesh is overreacting. She says her elder brother does'nt speak to her and she doesnt have a father and she respects siddhu a lot . 10.45 pm - Siddhu makes rajeev apologise to Uravshi and they hug and makeup. 11pm - Delnaz thanks niketan rajeev and aseem for the lovely food. Rajeev says he never wanted to hurt her . He says he did'nt like the idea that urvashi brought up their name while arguing. He says even Salman and the Bigg Boss team never asked him about them . Delnaaz tells siddhu that she is not rajeev's wife anymore otherwise she would have made him understand properly that he should not taunt anyone . She says this is the way he has treated her the whole married life . Precap - Rajeev makes Delu smile --- A calm before the storm ?? Looking forward to the Urvashi - Rajev fight/drama! Baaje Re Baaje re Baaje Re Dhol Bhaaje Re...ki Dham Dham...BB ka aaj ka Dhol baj gaya! Dholi taro dhol bhaje song is playing and Aashka, Urvashi, Sana, Vrajesh, Kashif and Sampat ji are dancing. lol! Dhol Baaje song for morning alarm. Why sapna aunty has problem in everything?